United States, Washington, Washington- U.S. The first time I gazed up at Mount St Helens was in 1988. While attending summer courses at University of Seattle, some fellow students invited me along for a drive around the mount to see if ash and chunks of volcanic rock were still in the ditches; leavings of the catastrophic volcanic eruption of May 18, 1980 – and sure enough, us sample seekers were not disappointed. On that fateful day in 1980 an earthquake measuring 5.1 on the Richter scale caused an avalanche of mega proportions as the side of the mountain was torn away, which in turn released a massive explosion of gases that blew the top off the mountain reducing its height from 9,677 to 8,360 feet (2,946 to 2,550 metres). The gases along with rock debris travelling hundreds-of-miles-per-hour levelled 100,000+ acres of forest as if the trees were matchsticks. The second time I looked upon this volcanic mount was on a motor trip with my husband Rick in 2004. The day was brilliant. Steam and ash belched from its maw and wafted into the atmosphere like a giant with indigestion. At the Johnston Ridge Observatory a documentary film of the apocalyptic event of the 1980 eruption relayed the sad loss of 57 lives and the unbelievable experiences of survivors who were in nature’s calamitous path. Lumberjacks were blown downhill and fly-fishermen looked up to see a wall of muddy water descending upon them and tossing them in the soup of logs, rock and debris. I learned not all lavas are the same; Mount St. Helens lava, called dacite, has a high level of silica rendering it thick and crumbly compared to Hawaiian basalt, which has the composition of syrup. Later news reports stated this series of small explosions in 2004 heralded tamer eruption and continuous lava flows for several years following. 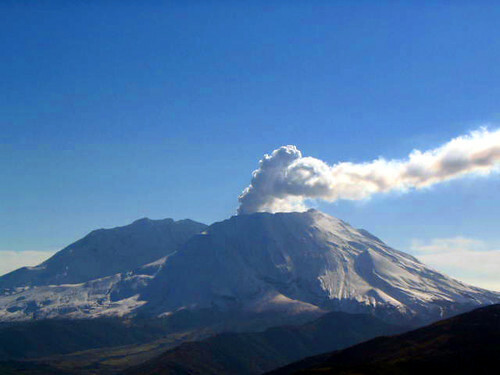 serendipitous, as we are showing Seattle and area to Reuven and Miri, our visiting friends from Israel, and Mount St. Helens is #1 on their list. And no entry fees at the Johnson Ridge Observatory this day is a bonus! Although the mount is draped by low clouds and thick fog, film footage and details of the eruption has not lost its fascination for us and Reuven and Miri are awestruck. We are riveted by Ranger Todd’s updates on the glacier that post-eruptions has been forming below the tall back rim of the crater and around the black stone lava cone projecting from the levelled area. The result is, “the only donut-shaped glacier in the world,” according to Todd, “that has slowly been building from added snow to its present phenomenal size.” Noteworthy also is with the yin and yang of nature, the land that was levelled and scraped clean of life has seen renewal in the spouting of new bushes and trees, which in turn has led to the slow return of wildlife. With our minds swirling with old and new facts of this renowned volcanic mount, it is onto Seattle where we blaze around town trying to fit in as many sights as possible within a few days. Pike’s Market is filled to the brim with produce from local farmers and crafts of every description. Spectators pool around the fish vendors to see them toss a large salmon or trout from one to another across a 9-foot distance just for the “halibut” (pardon the pun). Surprisingly all of these slippery flying projectiles are caught – at least during the time we are watching. Down from Pike’s Market the “Great Wheel” makes its rotations. This Ferris wheel of enclosed gondolas reaching 200ft above the water promises fine views of the city and Pudget Sound….that is, if it is a sunny day, which today is not. But the heavy cloud and sporadic showers do not deter us from walking about. We let our noses guide us into the eateries of Miner’s Landing. Our first feast of flaky mouth-watering salmon, savoury wedge fries, tangy tartar sauce and creamy coleslaw becomes our standard order. Ambrosial homemade ice-cream rounds off the food groups. The Seattle Aquarium is a perfect stop on a rainy day. We enjoy watching the out-of-water agility of a sea lion of great girth as he climbs a 45-degree-angled incline, placing his flippers on the rocks with the precision balance of a ballet dancer. The sea otters using their tummies as trays lunched on crabs, frequently rolling in the water while hanging onto their stash. This maneuver is not only a part of otter behaviour for washing scraps of food from their fur, but is done for several hours throughout the day in order to trap a layer of air inside their two layers of fur, which keeps the water from touching the otter’s skin. Otters have the densest fur of any animal on the planet, but no insulating blubber, thus there fastidious grooming and rolling is imperative to keeping them warm and dry. Many fishes and sea creatures later we are ready to call it a day. The next morning the weather is still drizzly, so going underground seems apropos. 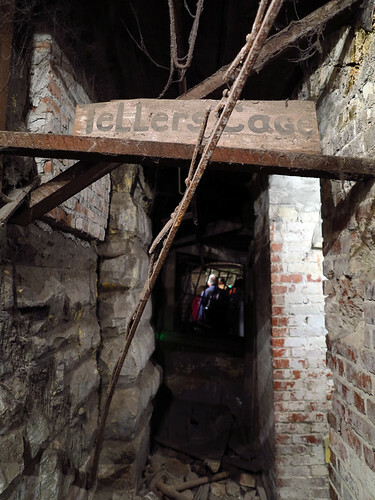 We purchase tickets for the Seattle Underground tour to see some evidence of Seattle’s bizarre history. The original wharves and businesses on the waterfront were constructed of wood, the ones nearest the water on stilts to accommodate the ebb and flow of tides, and just back of this were more flimsy wood buildings at ground level. This comprisal was a fire waiting to happen…and it did. In 1889 what is known as the Great Seattle Fire destroyed the city’s main business district. The city fathers did a good thing mandating the shops be rebuilt with brick and stone, but instead of building on higher ground they decided instead to raise the streets a storey above original roadways. This was done by erecting concrete retaining walls on each side of a street, then filling it to the top with packed earth. Citizens now had to leave their horses, or horse-and-buggies on the elevated roads, and climb down a ladder to reach the shops. Although some horses fell over the edge and about a dozen men (probably on their way home from the tavern), this was more-or-less okay – until that is… a fellow named Crapper invented the water closet (which we know as the flush toilet). Seattle citizens were gung-ho to try this new contraption, but much to their chagrin when the tide came in the sewers flowed backwards, turning the “crappers” into fountains. Not good! The toilets were then moved up the hill, a rather long trek from the shops. It was the Klondike Gold Rush (also called the Yukon Gold Rush) that took place in north western Canada between 1896 and 1899 that lifted Seattle out of depression and also raised the business district out of the muck. Eager to better capitalize on the gold-fever economic boom, the city was quick to build up from the muddy ground, turning the first floor windows and lobbies of the buildings into basements. Sidewalks soon bridged the gaps between the streets and the second storeys of the buildings, leaving hollow tunnels between the old and new sidewalks – inadvertently creating today’s underground passages. Seattle promoted itself to the great volume of north-bound gold seekers as the only place to get outfitted. Everything about Seattle bulged – from the population, merchants, the city coffers…. along with a few less desirable escalations. Rats soon moved in too with the huge stockpiles of food, outfits and gear for the prospectors. Ten cents a tail offered to control the vermin backfired when young boys caught the entrepreneurial spirit and started breeding rats for their tails. Rampant gambling, liquor and other services with ladies at the helm (tactfully referred to as seamstresses by our guide – wink, wink) were soon underway, all tastefully out of sight in the first floors of the buildings – now underground. We mosey on to the Klondike Gold Rush Museum to garner more particulars about how this flow of prospectors swelled Seattle’s economy. The term “ton of provisions” became the jargon of the day. Considered a year’s supply of food, this so-called ton of provisions was not an option. Canada’s Northwest Mounted Police required a specific amount of essentials (350 pounds of flour, 150 pounds of bacon, and 100 each of beans and sugar) before giving gold-seekers access to Canada. One hundred thousand gold-seekers moved through Seattle bringing in $50,000,000 on their way north. Not as many came back, not anticipating the hardships of treacherous passes through the frozen north, starvation, sickness, frost bite, hungry bears/cougars. 0nly 30 or 40 thousand reached Dawson City (the camp near the gold strike), only a few hundred found enough gold to call themselves rich, and a mere handful managed to keep their wealth. The combination of this museum and the Underground tour left us delightfully saturated in the city’s history. 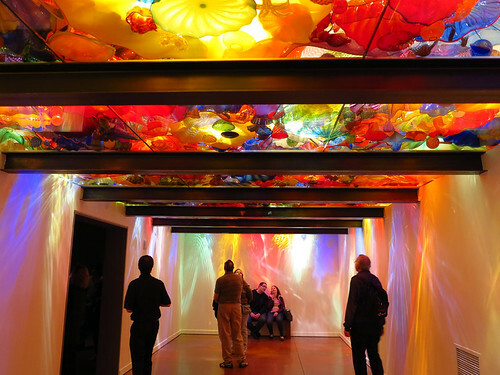 Our next day’s excursion, under sunny skies I might add, is to the Chihuly Garden and Glass Museum for a journey into a fantasy realm of vibrant hues and medusa snaking forms in gigantic chandeliers and petals of Jurassic-size flowers refracting light as if flecked with fairy dust. The brilliant artistry lies in the creative mind of world-renowned glassblower Dale Chihuly. Losing his depth perception in one eye in a car crash at the age of 35, and a body surfing accident a few years later did not deter Chihuly from producing his masterpieces, but instead he forged ahead with his creations aided by a talented team. There is a gift shop at the exit where the least expensive Chihuly bowl can be had for $7,000! It pays off being tour guides for visitors, as we see sites with Miri and Reuven that we have never seen on previous Seattle visits. 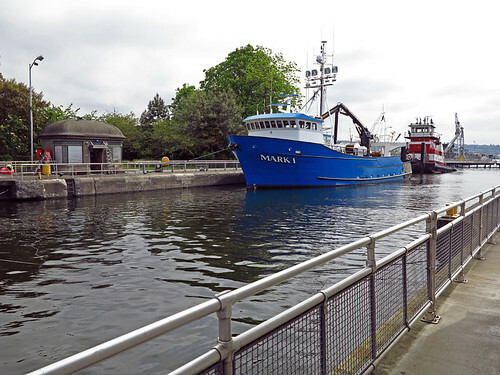 One such site is the Hiram M Chittenden Locks (locally known as the Ballard Locks). Expecting a rough wharf-type setting, it is an unexpected pleasure to find the entrance path in the midst of Carl S. English Jr Botanical Gardens, a park with a wonderful array of plants from around the world. The locks were completed in 1917 by US Army Corp of Engineers to provide a transportation route between Pudget Sound and Lake Washington. We watch a kayak and several yachts being elevated from the level of the Sound to the level of Salmon Bay (one of several water bodies before Lake Washington is reached). On another side the reverse is taking place with an ocean-going freighter. A 10-step fish ladder constructed around the same time as the locks was replaced in 1976 by the 21-step ladder of today. Alas, the fish ladders and therefore the viewing areas are closed for maintenance so we have to imagine the tired salmon after a long migration still having to jump from ladder to ladder to reach their spawning grounds – the place where they were born and where after spawning they will die. Depending on the time of year there could be Sockeye, Chinook, Coho or an endangered Steelhead. In the spring there is also aid for the smolts (young hatchling salmon) in their journey back from fresh water to the sea. Channels ending in chutes called smolt flumes are where they pour out of in a stream of water and are further protected by ropes strung over the spillway to thwart diving gulls and other birds. Our time in Seattle comes to an end. As we wend out way back to Canada our friends relay their thrill of it all – from the sighting of St Helens to the endless variety of Seattle – rain or shine. And for Rick and myself, our Seattle stint was even more enjoyable in the company of good friends.